Banbury Bulls slipped to their first defeat in 22 Wadworth 6X South West One East outings, going down 21-12 at Marlborough. 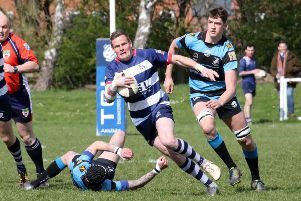 Matt Goode’s side gave it everything on Saturday but new boys Marlborough held out as Bulls had a late score ruled out. Marlborough took the lead when a forward looking pass in the build-up ended with Miteli Vulkijapani running in from out wide to score under the posts, with Tom West converting. Bulls lost Kallum Dixey through injury and Jack Briggs was the victim of a late tackle off the ball. Marlborough increased their lead when a sliced penalty found Vulkijapani who expertly plucked the ball out the sky and out-sprinted the covering defence to score under the posts and West added the extras. Bulls dominated possession towards the end of the half but Marlborough nearly extended the lead with some incredible sevens style rugby from deep before knocking-on. Bulls started the second half well, pinning Marlborough in their own half. Bulls were awarded a penalty try when Dan Brady kicked a loose ball through and was sprinting his way over in the corner before being taken out by two players. Josaia Visei slid in while Vulkijapani went high and saw yellow although there could have been a case for both players going off. Despite being a man down, Marlborough extended their lead with a brilliant try. Joeli Radovu plucked a cross field kick out of the air and sprinted his way over with West converting to make it 21-7. No sooner than Marlborough were back up to 15 players they were back down to 14 after Lemeki Moala was given a yellow for a high tackle on Sam Carr-Archer. Jimmy Manley was also taken out miles off the ball but the referee missed the offending player and could only award a penalty. Ed Phillips kicked the resulting penalty before Ian Isham gathered the ball at the back of a rolling maul and, after the pack worked him into a position, he scored out to the left. Phillips pushed his hurried conversion attempt wide to leave Bulls trailing 21-12. Bulls went looking for a bonus point and were camped five metres from the Marlborough line. The penalty count rose and several line-outs followed. Carr-Archer looked as though he had scored but no whistle came. Isham went for the line but the referee ruled Carr-Archer was held up and that was that. A tough decision which left Bulls with nothing from the game.